Earl of Loudoun, named after Loudoun in Ayrshire, is a title in the Peerage of Scotland. It was created in 1633 for John Campbell, 2nd Lord Campbell of Loudoun, along with the subsidiary title Lord Tarrinzean and Mauchline. The 1st Earl's wife Margaret was the granddaughter and heiress of Hugh Campbell, who had been created Lord Campbell of Loudoun; he resigned the peerage in favour of his grandson-in-law, who was later created an earl. Campbells of Loudoun are the oldest branch of the house of Argyll, and are descended from Donald, second son of Sir Colin Campbell of Lochaw, and brother of Sir Neil Campbell, the friend of King Robert I Bruce. The title is derived from the barony in Ayrshire, was originally the possession of the Loudouns of Loudoun, one of the oldest families in Scotland. Margaret of Loudoun, the heiress of the estate, married Sir Reginald Crawford, High Sheriff of Ayr, and was the grandmother of Sir William Wallace, the famous Scottish patriot. 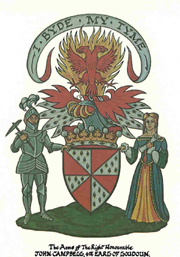 The barony passed to the Campbells in the reign of King Robert (the Bruce) by the marriage of Sir Duncan, son of Donald Campbell, to Susanne Crawford, heiress of Loudoun, and fifth in descent from Sir Reginald Crawford. Sir Hugh Campbell, Sheriff of Ayr, was created a Lord of Parliament by the title of Lord Campbell of Loudoun, by James VI., in 1601. His granddaughter, Margaret Campbell, who inherited his title and estates, married Sir John Campbell of Lawers, a descendant of the Campbells of Glenorchy, later known as the Campbell of Breadalbane family. The 6th Countess married the 2nd Earl of Moira, who was later created Marquess of Hastings. The next three Earls also held that Marquessate. However, with the death of the 4th Marquess, the Marquessate became extinct, but the Earldom passed to the elder daughter of the 2nd Marquess. The heir apparent to the Earldom uses the courtesy title Lord Mauchline. Note: The Earldom of Loudoun was held by the Marquesses of Hastings from 8 Jan 1840 until 10 Nov 1868, when on the death without issue of Henry Weysford Charles Plantagenet Rawdon-Hastings, 4th Marquess of Hastings, 9th Earl of Loudoun, etc., the Marquessate of Hastings and other non-Scottish titles created by patent became extinct, the English baronies by writ fell into abeyance between his four sisters, and the Earldom of Loudoun, etc., passed to his eldest sister. The heir presumptive to the Earldom of Loudoun is Hon Marcus William Abney-Hastings, Master of Loudoun, second son of the 14th Earl of Loudoun and brother of the present Earl.